Exactly. It doesn't matter how you draw the graticule, as you set the gains (vert. and horiz.) to match. If you draw a 6cm x 6cm graticule on a bit of lexan/perspex with a indelible pen it will do perfectly well. My old Heathkit OS2 and I suspect the OS10 I have somewhere were the same. Back when I was doing printed-circuit layouts on a light table, the table had a mylar overlay with a grid pattern printed in inches and tenths. New overlays had to be cut down to fit the table so there were offcuts available for making scope graticules. Unfortunately even if you could find an overlay now, it would be stored rolled up, and you'll never get the mylar to lie flat. The mylar was much better than the original celluloid or acetate graticules. I had hoped some caps would have come today but they didn't make it. Maybe tomorrow. I noticed something a little disturbing today. The CRT turned and the socket didn't. It didn't rotate a lot but it definitely moved and the socket never budged. I hope the tube is not bad. The tube should be ok. I had one do that and I just used some 3M yellow weatherstrip adhesive to glue it back. Ok, that sounds good to me. It's not a real expensive CRT but I'd rather not have to replace it. Manualman had the manual that I needed so I bought it from him. He supplies some extremely high quality manuals. I highly recommend buying from him. Parts are all here. Now I have to make the decision - cap and bad resistor swap or tear down, clean, replace wires, etc? The wiring is all solid conductor "thin" insulation. The insulation is stiff and brittle on the old wiring. I would replace it with stranded, more modern wire and attempt to stay true to the colors. The chassis is pitted and needs a good cleaning. The circuit boards are dirty but cleaning a test section produced nice results without removing the silkscreen. It will be much easier to test components and clean after the boards are removed. The rear board isn't that bad. It needs some new caps and possibly new resistors. My primary concerns are the plastic and rubber parts. Especially the rubber parts. The rubber around the neck of the CRT is hard as a rock and I assume that it's very brittle. If I break the rubber or whatever it is, can it be replaced? Is it supposed to be "set up" or soft? If it's supposed to be soft I should replace it but with what? Some of the wire is laced. I've never done that. Is it hard to learn and what is the material? I would rather not use a tie wrap in this scope. There are two RF chokes from the CRT to a tube socket on the rear board. I should be able to desolder those with the Hakko and not screw them up. The CRT socket should be easy to remove but if it breaks, is that available? The tube sockets look ok but if I break one I have modern replacements. The hole spacing for the bolts isn't usually as wide as the bakelite sockets in the Knight kits. I haven't found a source for those so I would have to drill new holes in the chassis. The sockets in the circuit boards are just going to have to agree not to break. I have some PC board sockets too but I'd rather not go there. There's always a risk of lifting a trace on a circuit board but I think that I can desolder components from the boards without screwing them up. So your question may be- Why spend the time to polish up Miss Piggy? I often think about that when I work on an old item that isn't "worth" a lot of money. But if it makes me happy, I don't really care what others think because it is my hobby and that is what I like. That said, go for it. Go for the whole tear down and treat yourself to a Knight-Kit that you could build following the assembly instructions. I did that with a Dynaco SCA-35. I sold it later, didn't make any money. But "I" had the fun of assembling it. The CRT socket is available. A few years ago I bought two new ceramic sockets for that CRT as I needed one for a project I was going to do. The project never happened and when I got the heath solid state kit scope I used that socket in place of its original CRT socket. If it uses those phenolic wafer sockets I'd recommend replacing them anyways with a better quality socket. Why spend the time to polish up Miss Piggy? Nothing more satisfying than seeing a vintage oscope properly working. Linen is traditional but fishing line or heavy thread will work. Use the "C" method which is more secure. It's no more work than "B"; you just give the loop an extra half twist as you go. If the thin solid wire uses rubber for the insulation then definitely replace it, but if it is the plastic type insulation then it should be ok unless it is cracking and/or crumbling. The CRT turned and the socket didn't. 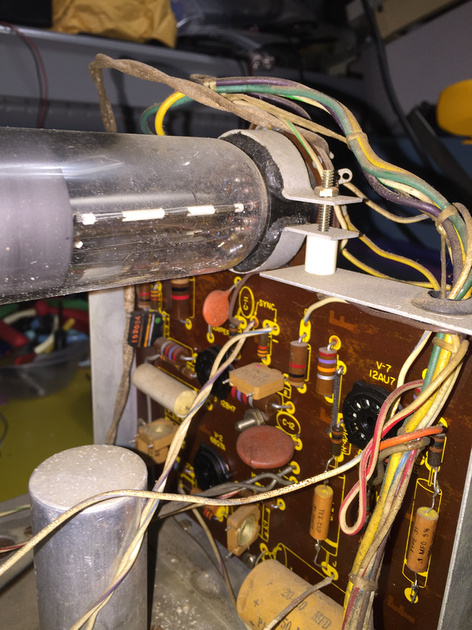 When you remove the socket, hold the base of the CRT, not the glass. The object is to prevent the base from moving with respect to the glass so you don't break the wires between the two. If they are just strips of rubber and not molded into a special shape, there are a variety of choices to replace it. Weatherstripping comes to mind. It is soft but may be what you need. If not, try an auto parts store to see if they have gasket material. That's stiffer but it may be red color. And then there is always the option of cutting a piece from an old inner tube. It's a bit expensive but you get a lifetime supply. Search for "lacing cord" for other options or other suppliers. You may find some surplus or on Ebay. Why do it? Because you want to. It's a hobby, not a business. I think it was supposed to be semi-soft and it just rotted. It doesn't have to support much weight so just about any kind of rubber that is thick enough but not too thick should work. Any of the suggestions I made above should be fine although you may have to use several layers of the thinner ones. I would avoid foam rubber however, since it crumbles in a rather short time. Some types of foam plastic would work as well. When you remove the CRT, glue the base on and let it dry before you try to remove the old rubber. I'll visit an auto parts store and see what they have. The material is about 3/16" all the way around and was probably 1/4" thick "back in the day". It's called a "rubber pad" in the parts list. I bought two kinds of glue. Gorilla glue and some stuff called Go2Glue. Of the two, Go2Glue is the only one rated up 175°F, if that matters. The circuit board wiring is desoldered and I've pulled the board on the chassis. It's time to pull the tube and I want to be sure I get the base glued on with the right stuff. Is this to glue the CRT socket to the glass? I think you probably want silicone. In recent years that's how the sockets came attached on rebuilt CRTs. It was probably the type used on high voltage connections in TV sets. Both of them recommend roughening smooth surfaces like glass, but then, most glues say that. Both of them cure by absorbing moisture so they both recommend moistening, but not wetting, non-porous surfaces. Both of them recommend wearing gloves. Go2Glue is elastic, which is good; Gorilla Glue doesn't say. Correct. It's a little loose and I don't want to risk breaking wires during the rebuild. Silicone like plain ole RTV? Silicone like plain ole RTV? Yes. sort of. Dried, it was stiff and flexible like the "pure" "GE silicone" at the hardware store. Not easy to tear like the automotive stuff. In TV repair there was a special silicone used for high voltage connections that did not outgas a conductive chemical as it dried. I'm guessing that's probably what they used. I don't think it mattered as long as you allowed it to really cure hard before powering up. Maybe others can comment. On high voltage caps on projection TV's, I used whatever silicone gasket sealer was handy from doing automobile work. Remember the high voltage for that tube goes through the socket, so I think the main concern would be that whatever you use be NON-conductive.